*Weddings/Events – If held on property or private beach an additional $500.00 HOA fee is required for permit. **Please note tents and canopies are not allowed on private beach due to HOA regulations. Electric Street Legal Golf Cart Rentals — We offer electric street legal golf cart rentals to Beach Reunion guests only and at a substantially lower rate than our competitors in the Destin/Miramar Beach area. If you are familiar with this area you know from past vacations that their popularity makes traveling to and from the beach a breeze and convenient for quick errands to the store, even for that last minute shopping spree! They also make shuttling services hassle-free for weddings or events. By reserving a cart rental through us you will not have to worry about any of that unwanted dirt or sand getting into your car while trying to enjoy your vacation! We even deliver for free! For additional information on our electric golf cart rentals click here. Call us today to reserve a 4-seater or 6-seater street legal golf cart with your vacation rental home! Pool Heat - From October 1st - May 1st, the private pool can be heated for an additional Daily/$50 or Weekly/$300. Pool heat must be purchased for the entire stay. services prior to your visit or during your stay. 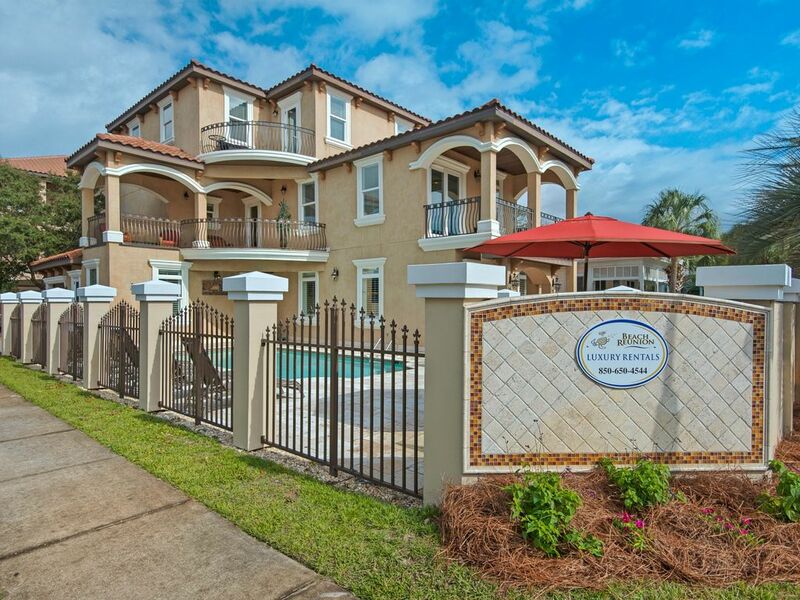 This property is centrally located between Silver Sands Outlet Mall and the Destin Commons. There are many restaurant and shops all within a 5 minute drive of the house. Amenities Beach Reunion Amenities Free beach chair service included from May 12th 2019 - August 10th 2019 *Includes 4 chairs and 2 umbrellas set up daily. Free concierge services- our concierge can help you plan the vacation of a lifetime! All linens and bath towels are provided. Please provide your own beach/pool towels. Starter set of supplies. We will get you started and you take it from there! *Includes toilet paper, paper towels, trash bags, dish soap, and dishwashing liquid. Fully stocked kitchen! It’s like cooking at your own home! This beach house will have everything you need and more. Grill out by the pool. This home has a beautiful gas grill. *Propane is included. Private pool. The private pool can be heated from October 1st - May 1st. *Please note there is an additional fee to heat the pool. All linens provided. Beds and linens are changed on guest departure prior to new check ins. Internet is available throughout Touched By The Sun and poolside. Cable provided by Cox Communications. Large pool deck for sunning. Fully Furnished. All Main living areas of the home are located on the 1st floor including a King Bedroom. All guests check in at the property anytime after 3:00 p.m. Within the first 24 hours of check in, please let us know if there is anything that needs to be addressed. We want your vacation time to be relaxing and enjoyed. If you need anything during your stay, our office is open 7 days a week. We can be reached by phone or by email. I loved the house the only thing was that the door in my room was not closing properly it made a loud noice when opening and closing and sometimes that noice would wake us up from our sleep, but other than that we were all happy with our stay. Thank you! Thank you so much for staying with us and we are happy to hear you enjoyed your stay. We will make sure that maintenance is made aware of the door and have that repaired. Thanks for the feedback. We look forward to being able to host your and your family again. It was an absolute awesome vacation. The House was gorgeous and clean. The pool and hot tub was fun. The beach was stunning. We will be back! The beds were comfortable. The kids loved the game room. Well furnished and is located very close to the beach. We enjoyed everything about our stay. The grills need some tlc, but otherwise we highly recommend this property. Huge house at great location!! We had more than enough room for our family of 15. Everyone had their own bathroom. We could all fit comfotably in the kitchen/ eating area for meals. Beach access 1 block away. Beach toys at store one block away. Grocery 1/2 mile away, great restaurant 3 blocks alway. Only thing I would change is more shade with umbrellas, fans, or trees around west facing pool and balaconies. Very hot in the afternoon. This was a very nice house for 19 of us to stay in for a week. There was plenty of space, hot water, towels, refrigerators, and kitchen utensils to help prepare what little we cooked. We were very disappointed in the outside grill. One night we tried to grill chicken for 19 people but all the burners did not work. The grill really sucked. In the living room there were big pillars going to the ceiling. The pillar by the back edge of the couch was a toe catcher. We had to wrap a towel around the bottom so we would not stub our toes on it. Other than the grill and the toe stubbing pillar the house was great. The pool was a nice size. We could have used a umbrella or two since there was not a lot of shade for sitting out watching the kids in the pool. We had trouble with the TV not working, but after I called about it, they were prompt about getting it fixed. There was good parking for our 4 cars. overall great time. staff was attentive , when needed, which was only a couple of times. we had come in the day before and stayes overnight 10 minutes away. we decided to rive around area and stopped to look at house before 3, and owner came by and house was ready and let us in! what a great surprise and appreciated. shout out to Carrie who stopped by seveal timesto check on us and helped with the set up of our surprise wedding for our family. she even text me the day of wedding to say congrats and forecast looked good. what perfect day it was! we would definitely return. the reason I rated it a 4 star is just due to some minor repairs needed. -Destin Harbor within 7 miles. Offering fishing charters, sightseeing, restaurants and shopping. Breathtaking views of the open ocean and the harbor.